If an unknown search engine Search.ma-cmf.com ever replaces your homepage and/or is set as your default search engine, there is a 99% probability that a browser hijacker has successfully infiltrated your system. Even though this browser hijacker has an appearance of an ordinary search tool, it is quite risky to keep it because, even though Search.ma-cmf.com works as an ordinary search engine, it might cause many problems. Speaking more specifically, users might be exposed to potential threats since the search tool promoted by a browser hijacker might provide users with untrustworthy promotional links, and, secondly, the privacy of many users might be violated. More detailed information about this browser hijacker is provided in this article, so continue reading. The knowledge you get by reading this entire report should also help you to decide whether to remove Search.ma-cmf.com from browsers or let it stay. 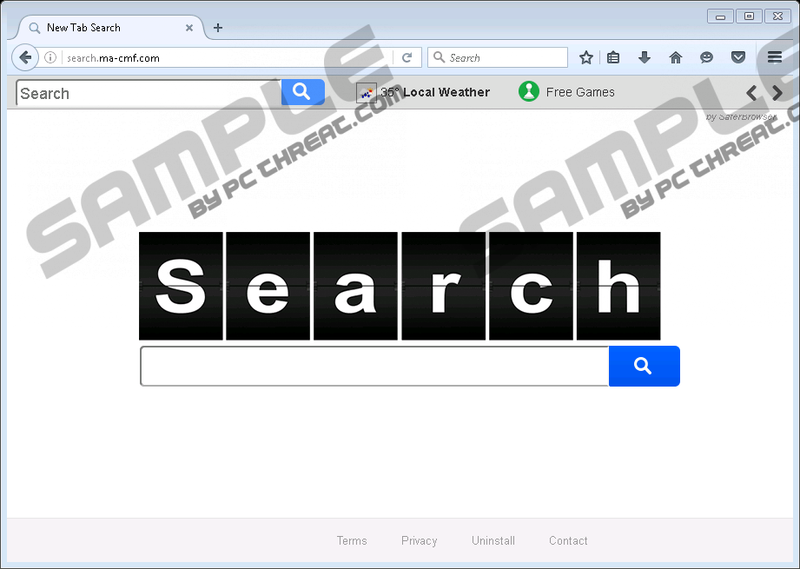 Search.ma-cmf.com does not look like a harmful search tool at first glance; however, security specialists at pcthreat.com have found that it can still cause security-related problems. Of course, it is not going to act like a Trojan, backdoor, or ransomware. According to researchers, this tool should, first of all, be eliminated because it has been found that it is very similar to such untrustworthy search tools as search.youremailnow.com and search.searchlttrn.com, which indicates that Search.ma-cmf.com cannot be trusted either. Secondly, thorough research carried out by our specialists has revealed that this search tool should not be used also because it might display sponsored search results. Even though this search tool displays Yahoo! search results finally, it might insert promotional links along the way. They are shown to users for advertising purposes only. These ads might not seem to be dangerous at all, so the majority of users do not think that they can cause harm to their computers too until they find out that these ads might promote websites with an untrustworthy content as well. These websites might contain anything, even malicious software, but you will not be informed about that, which means that you will not hurry to leave the website you will end up on and thus might allow unreliable software to enter your computer by simply surfing a bad third-party page. Search.ma-cmf.com belongs to a big family of threats, so do not be surprised if you come across another search tool having the same interface on your browsers in the future. Browser hijackers from this family are all distributed the same. Since they are often spread in software bundles with freeware, you might notice changes applied to all your browsers after the installation of a free application downloaded from a third-party website. Of course, it is not the only way browser hijackers are disseminated, but it is evident that users find it quite difficult to prevent these threats from entering their computers. If you have a feeling that you could not protect your computer alone as well, you should install a reputable security application as soon as possible and then enable it. Update it periodically and always keep it active to be sure that harmful threats cannot break in. There is a way to remove Search.ma-cmf.com quickly from browsers. All you need to do is to reset them all to their default settings. Resetting browsers might be quite a challenging task if it is your first time, so, in this case, you should follow the manual removal guide our experts have prepared for you. Even though you decide to erase this infection manually, you should scan your computer with an automatic scanner, e.g. SpyHunter to delete malicious components you know nothing about from your computer as well. Click Tools at the top to open the menu (tap Alt if you cannot find it). Mark the Delete personal settings box you can find there. Click Troubleshooting information you will find in the Help menu. Find and click on the Refresh Firefox button. In the confirmation window, click on this button once again. Double-click on your browser’s shortcut. Click once on the button in the top-right corner. Click on the Reset button in the dialog box. Quick & tested solution for Search.ma-cmf.com removal.